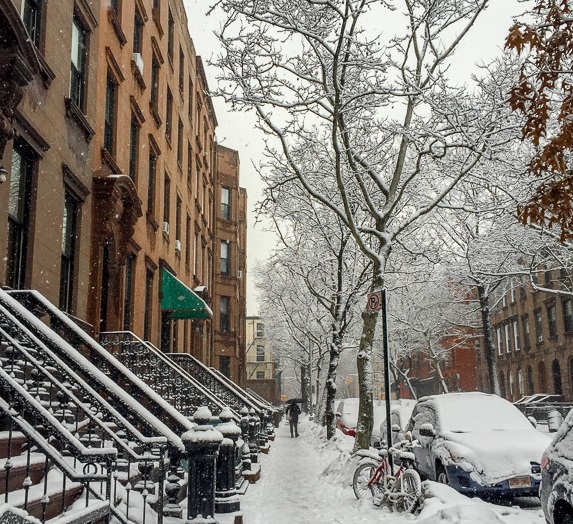 So the snow may still be pretty, but can it go away now please? It’s gotten so bad that our ceiling fell through this week. The gutters and roof above us were so clogged with snow and ice that it had nowhere to go but straight through the ceiling and on to our kitchen floor. Luckily nothing was damaged and we had a laugh as we scampered around in our PJs trying to find enough buckets and pots to stop our apartment from turning into one big lake. But still – enough now! So as a break, I’ve taken myself upstate this weekend… to an, erm, even snowier place. Oops. 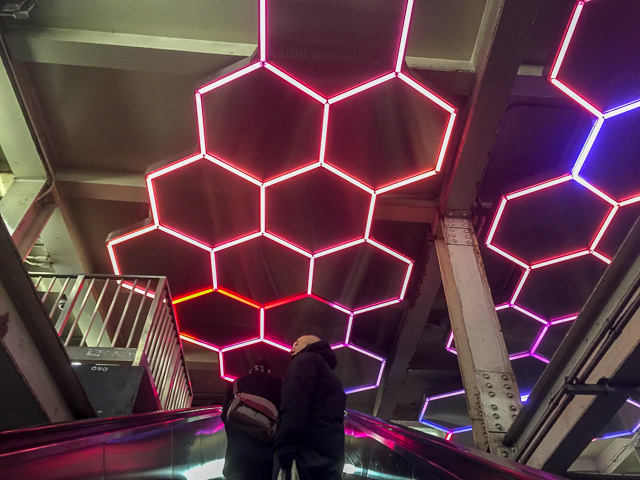 1 :: Subway art :: I always love ascending towards this LED work by Leo Villareal at the Bleecker Street/Lafayette Street subway stop. You can spy the changing colors as you take the escalator from the F train platform to the uptown 6 train. 2 :: Hidden courtyards :: I spotted this surprisingly spacious courtyard in the West Village last weekend as we walked towards the Friends apartment on our movie tour. Seeing as every sliver of property is worth gazillions in that part of the city, it’s nice that a bit of open space is still valued! 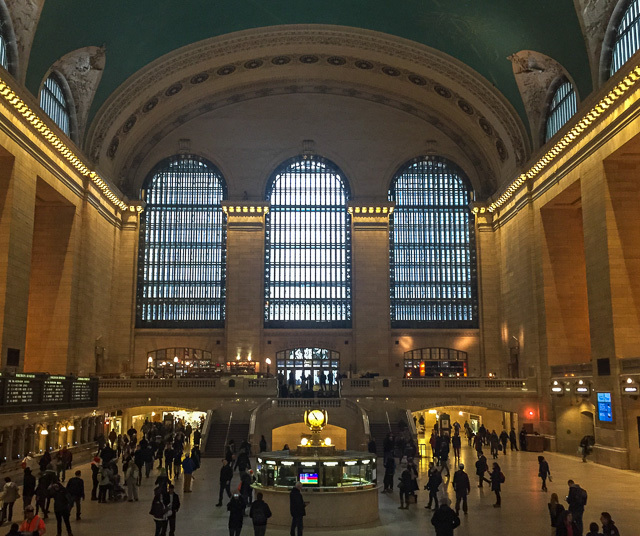 4 :: A glimpse of Grand Central Station :: I was near Grand Central this week, and while I didn’t actually need to go to the main concourse, I headed there for a glimpse because it always gives me an ‘ahhh New York!’ moment. It really is a beaut, and I love that it’s full of secrets. 5 :: Morning snow :: I have a confession. This week, in an attempt to go to the Today show, I woke up at 4.30am, showered, dressed and pegged it to the subway. 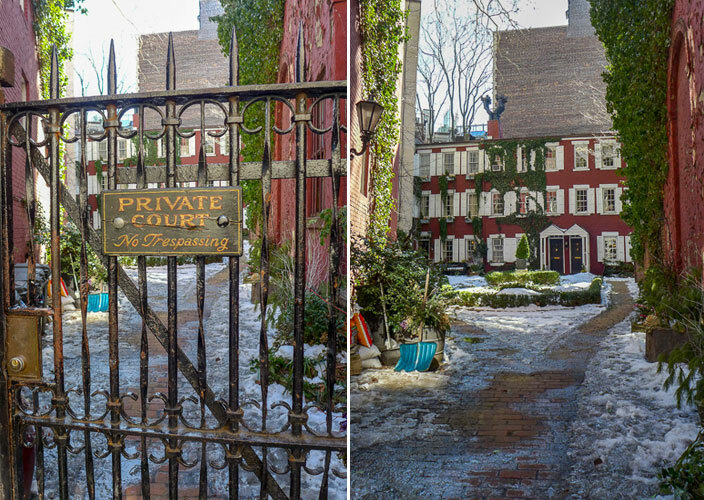 But once I got there, I was like, ‘No thanks.’ It was too snowy! So I left the subway station and headed back to bed. 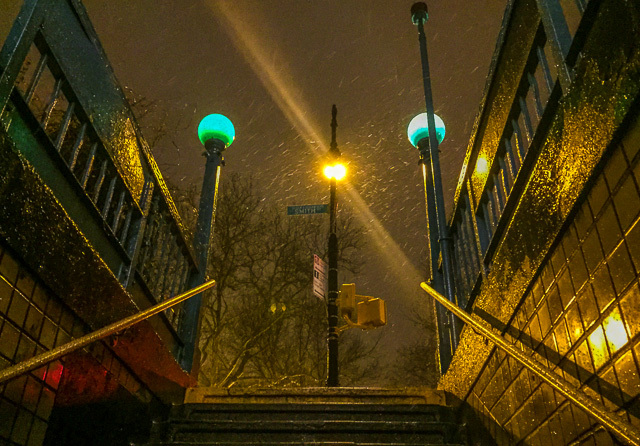 I felt pretty guilty about it (for no other reason than because I told myself I’d go) but the early morning jaunt did give me a sight of snow falling before the city woke up (well, everyone in the city but Al Roker). 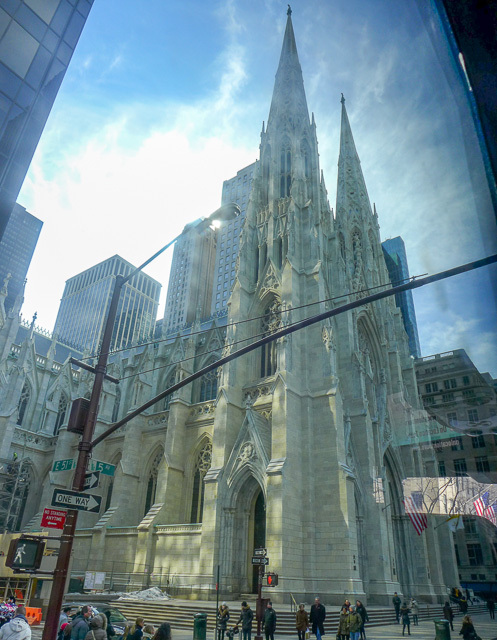 6 :: St Patrick’s Cathedral looking shiny and new :: I spied the cathedral up on Fifth Avenue this week (through a foggy bus window) and it was the first time I’ve seen it without its scaffolding, which was up when I went to visit. Doesn’t it look fab? I’ll have to head back. 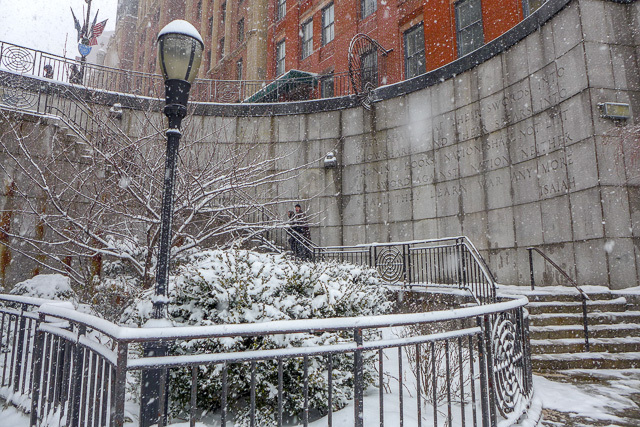 7 :: Newly discovered nooks :: I went to the United Nations for a tour this week (blog post to follow), and while I was up there, I came across some lovely little snow-covered nooks that I swear must have been borrowed from another city. Okay, that’s enough snow talk. I’m off! Have a lovely weekend, and stay warm! Great photos, hope your apartment gets fixed soon. 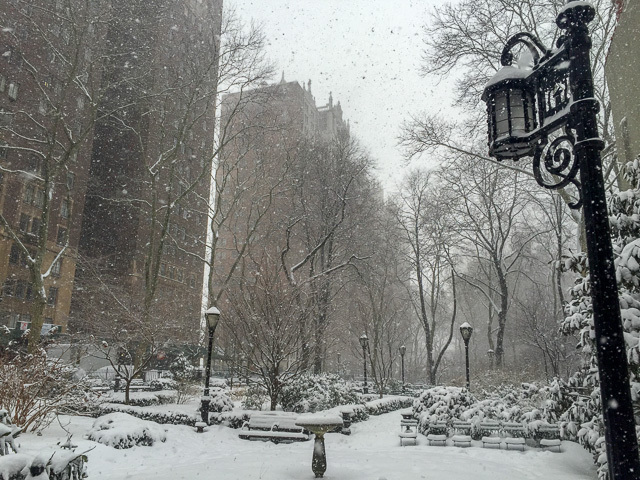 The snow does look pretty …. Can’t believe the roof caved in – that is crazy! Hope everything gets fixed up soon. Thank you 🙂 My landlady was amazing about it — it’s already patched up! Your poor ceiling! Glad you were able to escape, hope it’s fixed now!! 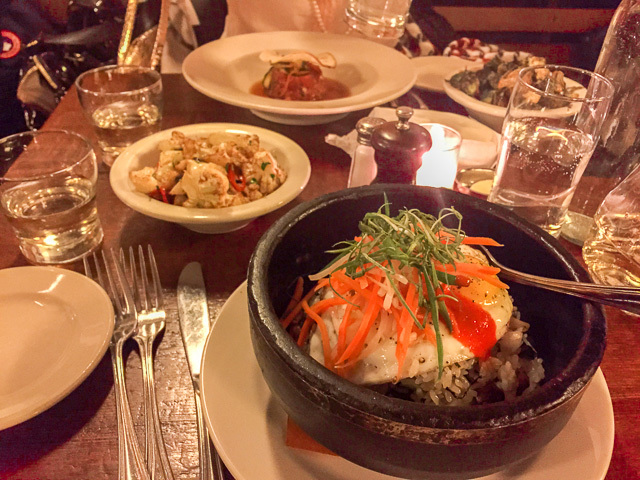 I just went to The Smith near Lincoln Center for the first time last week — so delicious! So pleased to hear your ceiling has already been fixed! Me too, I was so impressed with how quickly they did it! Thanks for reading Priyanka 🙂 And yes, it’s all patched up now thanks — it was a bit of a shock when it happened at 5am though!